Welcome to the world of Bob The Train Puzzle Game. One of toddlers favorite character Bob the Train along with his wonderful friends is here with a fun and exciting puzzle game that offers hours of non-stop entertainment to your little ones and at the same time helping in the development of their cognitive abilities and their creativity. The game has over 390+ puzzles combos all in Bob's world, a world that is familiar and safe to your toddlers. Starting with simple levels, your little ones can graduate to difficult levels at their pace and learn something new at every stage. Colorful and vibrant imagery will keep the toddlers interested, have fun learning and wanting to learn more. 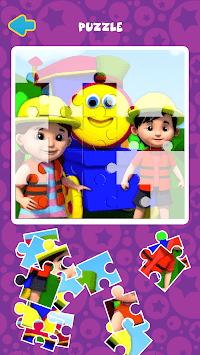 The puzzle game brings alive everyday things that the toddlers see around them in a rainbow of imagery. 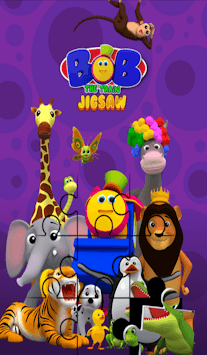 Unfold all the images and their puzzle combinations and enjoy solving the puzzle with unlimited fun. 1. On selecting the 2*2 puzzle, the image will divide into 4 tiles. 4. On selecting the 5*5 puzzle, the image will divide into 25 tiles. 2. 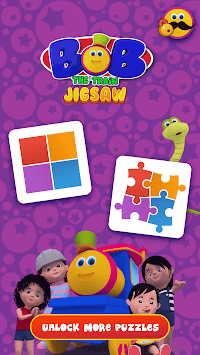 390+ puzzles combinations for your toddlers to have fun and be entertained. 3. Variable type of puzzle piece/tiles. 4. Unlock 80+ new puzzles combinations by watching ads and explore more fun. 1. Vibrant and colorful imagery for the kids. 2. Best activity for kids to learn while playing. 3. Developing skills to match and recognize different characters, colour, and shapes. 4. Sharpens your child’s memory. 5. Soothing and stimulating sounds to keep focus on the image. 6. High quality, appealing colour combinations & cute character pictures. 7. Amazing experience with your kid’s favorite character “Bob the Train”. 8. Non-stop hours of entertainment for kids. Every kid is fascinated by a train, especially when it comes chug chugging into the railway station. How would they feel if they could actually meet a train that can talk, sing and dance just like how we do? That is where Bob the Train comes in. Bob loves toddlers as much as they love him, and his favorite time of the day is to visit the kindergarten school and play with his young friends during their playtime! He is a good friend. He makes learning fun as they learn their Letters of the Alphabet, Colours, Shapes, Animals, Animal sounds, Nature, Numbers, Phonics etc, through the songs he sings. He also teaches them some valuable life lessons through stories. Bob chugs through the land of rhymes, imagination, and learning with a smile on his face, aiming to turn every kid’s frown into a smile.